It has mostly been a day of waiting for Katy. She was frustrated that she couldn’t go to the library today because her body was so worn out. She wanted to go, but her legs are too shaky. She did have another spasm this morning, but it was not as bad, AND a neurologist was there to watch it happen! He said he thought it was probably just stress-related because of the environment being so foreign to Katy, and said he thought it was temporary and nothing serious. That was reassuring, but the question is how do we lower the stress? The X-ray of her stomach didn’t reveal much, but it did reveal some good news about her pillcam. I don’t think I’ve blogged about that, but it’s a really cool piece of technology. About eleven days ago, when the doctors were trying to figure out what was wrong with her, they had her swallow an itty bitty camera in the shape of a pill that had enough energy to last for 8 hours, and sent pictures via wireless radio to a receiver unit. It was more like a “horse-pill” in size, but she was able to swallow it. The pictures told the doctors almost nothing (which HPSers know could easily be true). 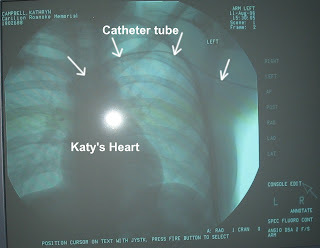 Katy’s X-ray today showed that it was pretty close to coming out. That was good news, although studies have shown it really doesn’t hurt anything to be in there for 2-3 weeks (which is the longest people have had them). What someone remembered last night (just in time!) was that she can’t get an MRI until the pillcam is gone since it has some metal in it. Phew! It’s God’s grace that someone remembered. For Katy to be relaxed, patient, and able to adjust to the more chaotic environment of the hospital. Pray that she will let the Peace of Christ go from her soul outward. For Katy’s spirits to be encouraged. She hasn’t been able to see the website in several days and wants to read your comments herself. For the hospital to be thoughtful of Katy’s needs. It startles her when they come in the room loudly and quickly, especially with her limited eyesight. Virgil and I have spoken of you often lately and with great fondness. You are such a special girl, always with a welcoming smile on your face. Ashley has been told of your condition and is praying for you also. I have friends out of town who are praying for you, on their knees, every day. Believe me, the Lord is hearing your sweet name often. I have no doubt that you will reach the other side of this filled with grace and great wisdom! We will pray for that peace that passes all understanding for you during this difficult time. Hang it there - we love you!! Just want you to know that my prayers are with you. I am going to offer my rosary for you tonight at my rosary prayer group. I thought about you quite a bit today. I volunteer at a local hospital, as I am no longer able to hold a full time job that would allow me to be out so often for callling in sick. Anyway, I delivered some flowers to a little elderly lady, who had been in the hospital for quite awhile. Needless to say the flowers perked her spirits right up, and I felt good about making her day. She said that she had been there for 2 weeks and wanted to go home very bad, and was even considering jumping out the window if she had too. It was nice to see that she had a good sense of humor about hings, and that reminded me of you. It seemed I thought about you all day, and even took a short time out of the day to pray for your safety and recovery. As soon as I got home I rushed to get my household things done so that I could read your blog. Hang in there sport, you’re in good hands!!! I just read the updates on your blog - seems I’m addicted to it! I am anxious to know how you are doing. I checked like 3 times today for an update! (Thank you Colin for keeping us in the loop!!) I couldn’t fall asleep last night after reading yesterday’s update so I just lay there praying for you - that you would have a good night. I hope you are having a better day. You know - Barbara Walker said in her post that you were going to come out on the other side of this filled with grace and great wisdom. I totally agree!! It’s ofthen the difficult things in life that will give us the greatest perspective, appreciation for Christ and his sufferings and a longing to be with Him and be more like Him. What an amazing thing! I will pray for your comfort this evening my dear friend! Be sure to keep checking older posts, as there are some new comments. Katy’s blog goes international! I just read the post from Sheena in Canada. I said a couple days ago that people were praying for you all over the U.S. Now we can say all over North America! What’s next? We’re praying you have a blessed rest tonight sweetheart. I love you. Wow! Read the latest post on August 10th, “The Best News So Far”, from Candace and Crystal. More pray-ers! This is an excellent point! It’s been a problem for me in hospital settings too (except at NIH where they get it.) Sometimes care givers would assume, for example, that as they were talking to me that I knew they were about to stick me, or do something to me - and sometimes when you don’t see well you don’t always know exactly when they’re going to do something. They should be saying, “I need to do…bla bla bla” or “I need to touch you to do bla bla bla…” It gets a bit much when you feel like you’ve even lost control of your personal space! Talking books also have helped me in the hospital to keep my mind busy and not thinking about everything going on around me. Keep hanging in there Katy! We’ve just got to meet up one of these days! I wish I lived closer so I could come see you. Good Morning Katy! Just sipping the first cup of coffee of the morning (bad Heather!) and checking up on you. I hope you had a peaceful and restful night and that you’re feeling a bit better today. I’ve had a number of e-mails from folks who are hearing about you and want to know how you’re doing. Not all of them have Web access. I talked to Candice and Crystal last night too - the twins that were also adopted from India. From learning about you from your family, I know you and the twins have a lot of interests in common. I can hardly wait for you to meet them one day. I’ll check in a bit later - off to work for me! Its your fellow 7th grade Indian brother from Lexington, VA. Just checking into your blog. One of my favorite TV shows is House. Dr. House is an incredibly brilliant doctor but he has no personality what so ever. Whatever he lacks in personality he makes up for with his knowledge of the human body. The show is based on how he saves patients lives while causing all sorts of drama between his co-workers and the lawyers that protect the hospital. Funny and serious at times. Colin was talking about the pillcam you swallowed and I remembered an episode of House where they used it. I am going to catch up on my episodes of Dr. House today, and I will be thinking and praying for you. Hope you feel better day by day. Just want you to know you are in my thoughts and prayers. I came to see you yesterday but you were resting. I thought you looked so peaceful. I’m sad to hear about all the pain you are enduring. Just remember that “You Are Strong” because God is strong in our weakness. I just read an email about a pastor in his 90’s saying that the one thing that sustained him when tears, heart break, pain, fear and sorrow paralyzed him…the only thing that would comfort was this verse…..”Jesus loves me this I know.” I’m sure you know the song! God is with you. I was reading your blog to Lorien and told her I was going to write a note to “little Katy” (since her sister, Katie is big right now with baby to come). She informed me that you were not little but big. Oh well, it made me laugh. Little to her is a 3 year old. I agree that laughter is good medicine. I hope you are able to do some laughing. I will pray for it.